I often forget how much my children can do completely on their own.. it is much more than I give them credit for. I find myself hovering over my kids, often frustrated, worried that they aren't going to do something "right" or that they are going to need help or will take too long. I find myself quick to jump in. Taking over a task before they are given enough time to work though the difficulty they are having and to complete the job on their own. It can be scary to give them the control. To let them make the decisions, even when you know if they "just did it my way" things would be easier or come out better. Letting go and accepting that no matter how it comes out, unless they ASK for help, I am going to let them fail (or more likely) succeed completely on their own is nerve wracking. But children also need a chance to prove they are capable and responsible. It is only when you let them do something for themselves, that they really gain confidence in their own abilities. As my kids get older, I have to face the fact they will need me less and less. It is my job to teach them how to do something, so I will no longer have to do it for them. The goal is for them to go out into the world capable and confident. It doesn't matter if it is riding a bike or doing a project at Home Depot, I want them to believe in themselves and at least try their best. They don't have to be afraid. 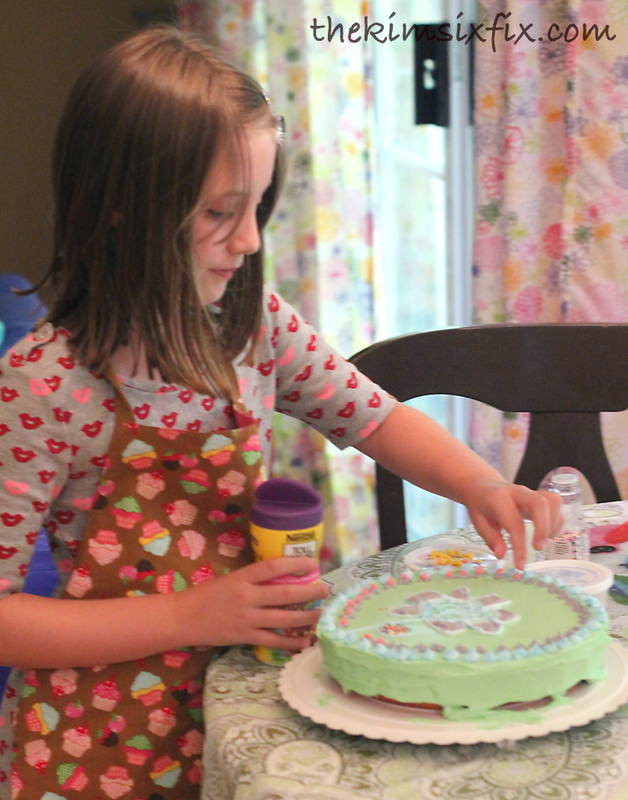 Sometimes I help build their confidence by involving or featuring them in one of my DIY projects, but today I found another opportunity.. in the form of CAKE. 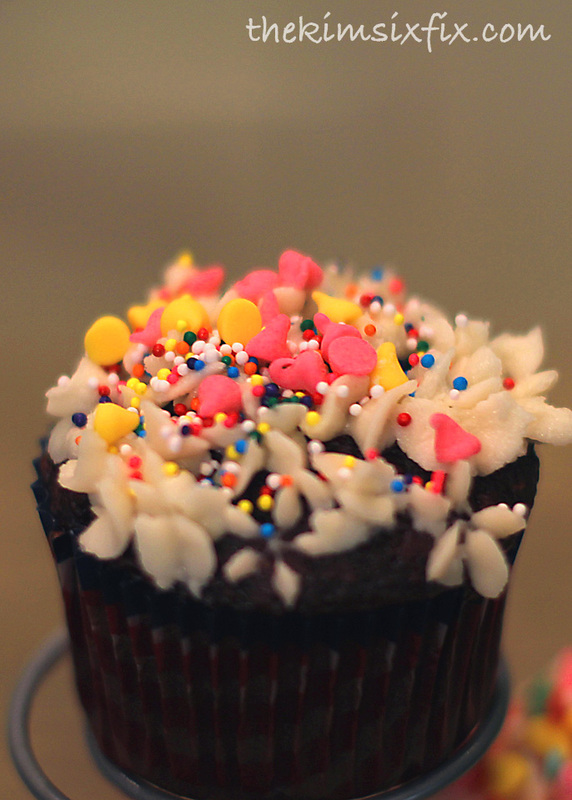 A week ago I posted some "ugly" cupcakes on my photo blog that my kids made with the leftover supplies I had from one of my own cake projects. 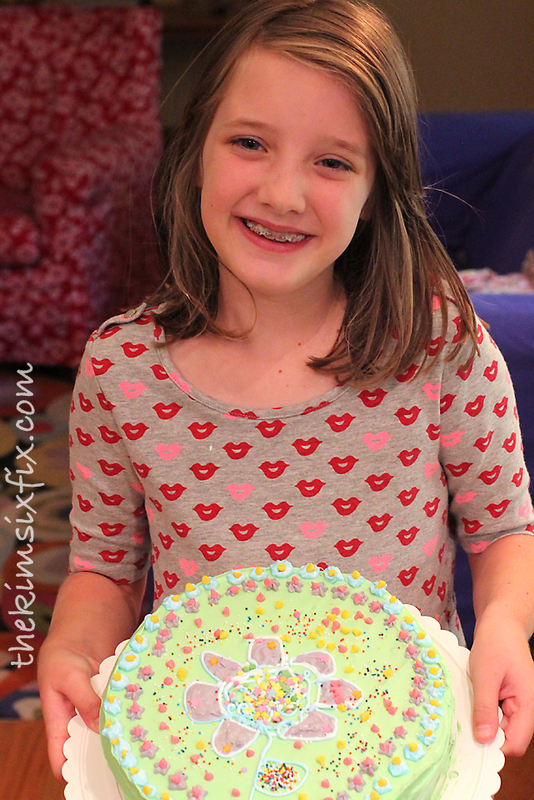 They had so much fun doing it that my eldest daughter was begging to make her very own full sized cake. I hesitated at first, just thinking about the mess and the hassle. I wasn't sure she would be able to do it. What if she failed? What if she got frustrated? I didn't want to let go of the control. But she was insistent that she could do it and so excited about it. We went to the store and picked out a boxed strawberry cake mix and tub of pre-made white frosting (her choices) and came back home and started baking. 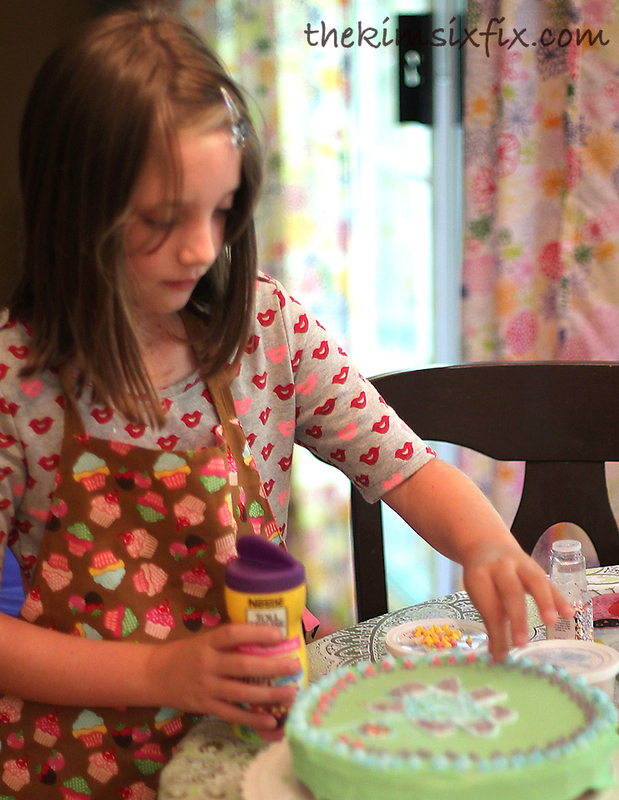 My daughters have helped me in the kitchen quite a bit in the past. They aren't strangers to baking. Standing by my side cracking the eggs, adding the ingredients, mixing the batter and licking the bowl. Therefore I wasn't surprised she sailed though the first part of the project. 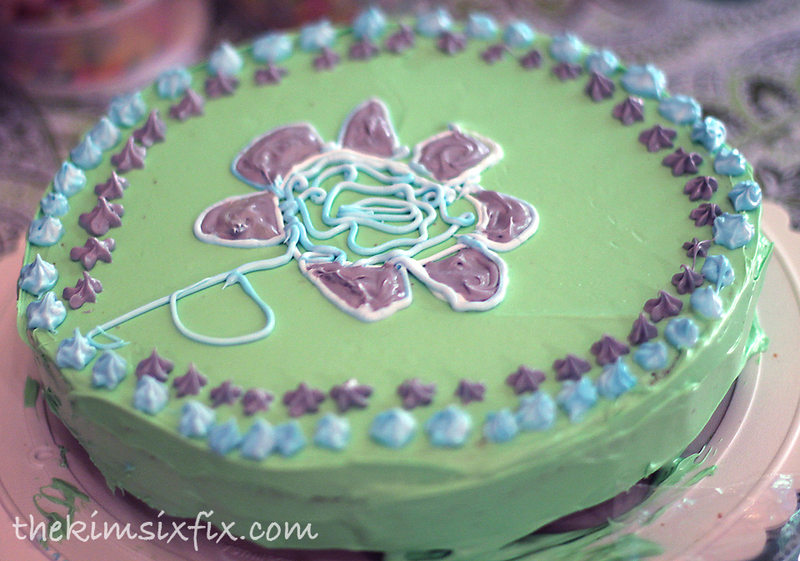 Baking a cake is one thing.. but decorating a cake was another story. This is something my 7 year old has never attempted on her own. First she decided that she wanted a blue, green and purple color scheme. 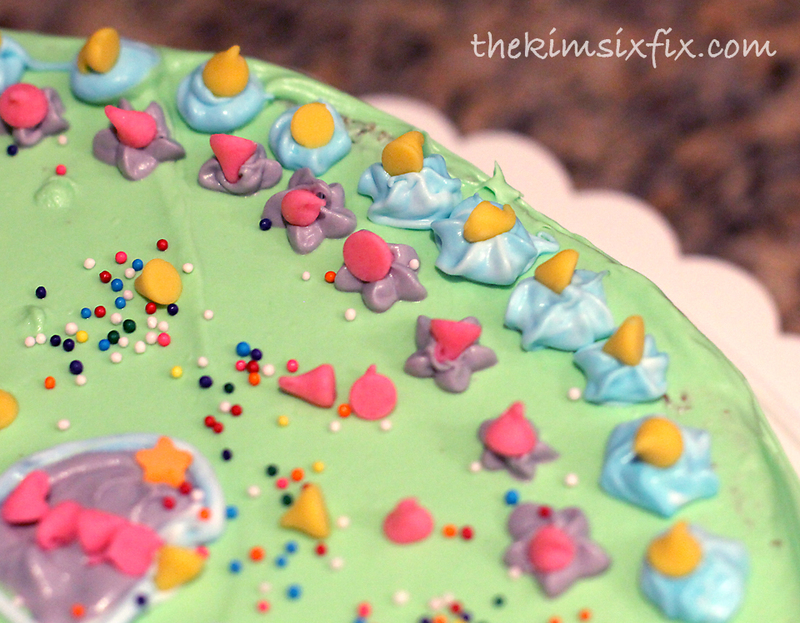 I helped her split the icing into 3 batches and she colored them using food color. Since we didn't have purple she had to mix red and blue and although the color was really more of grey-purple she was still excited about her choices. I had to bite my tongue since I would have chosen a different color, but I reminded myself that this was her cake. At this point I thought she did a great job. 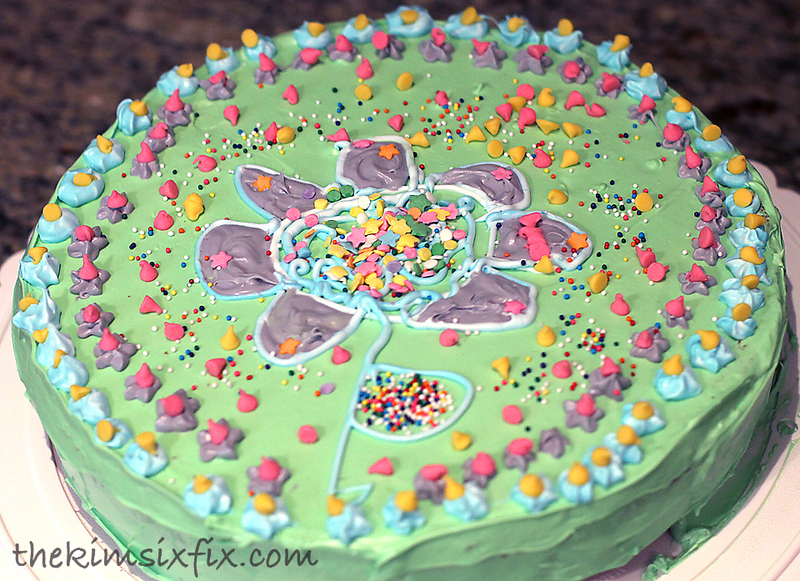 Heck, I have seen a LOT worse on CakeWrecks (at least her flower is edible). Of course, she wanted more! You did see those cupcakes didn't you? So she painstakingly sorted pink and yellow decorating chips and added them to every.single.piped flower. Talk about persistence! I never would have taken the time to do that. Is it the cake I would have chosen to make? No. Is it still beautiful and wonderful? Of course. I admit I was surprised (and impressed) by how little help she needed. My fears were all unfounded. My little girl is growing up and I have to give her more chances to prove it to me, and to herself. 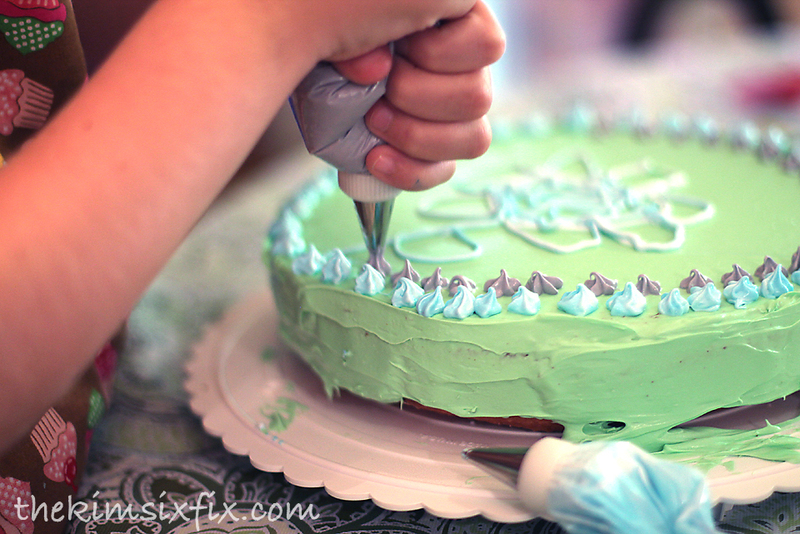 I am not sure who learned more with the experience: My 7 year old, who now knows just a little bit more about baking a cake..
Or me.. who knows a lot more about letting go. 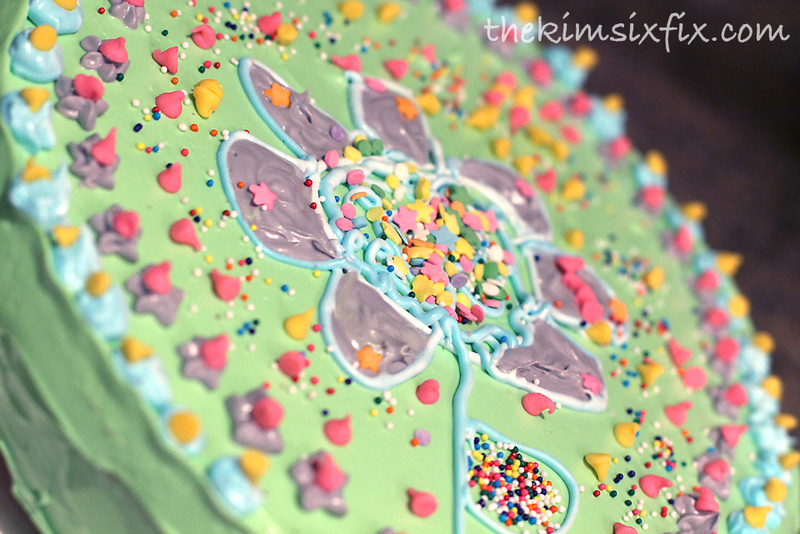 As I was writing this up I stumbled upon this old post (and this one, and this one and this one) and I realized just how much I blog about cake. Sorta fitting don't ya think? I'm sharing this post here. She did an awesome job! I find it very hard not to show my son the "right" way to do something or to intervene when I think he needs help/will make a big mess/etc.. I try to be conscious of it so that he can learn on his own, but it's tough sometimes! I find the hardest part is when he wants to help us do something, and it does matter if that thing is done correctly/neatly (i.e., painting the baby's room). In those cases, we just try to find some related task he can do, but sometimes it's hard! I'm so glad that I'm not the only one that does this. Thanks for sharing! 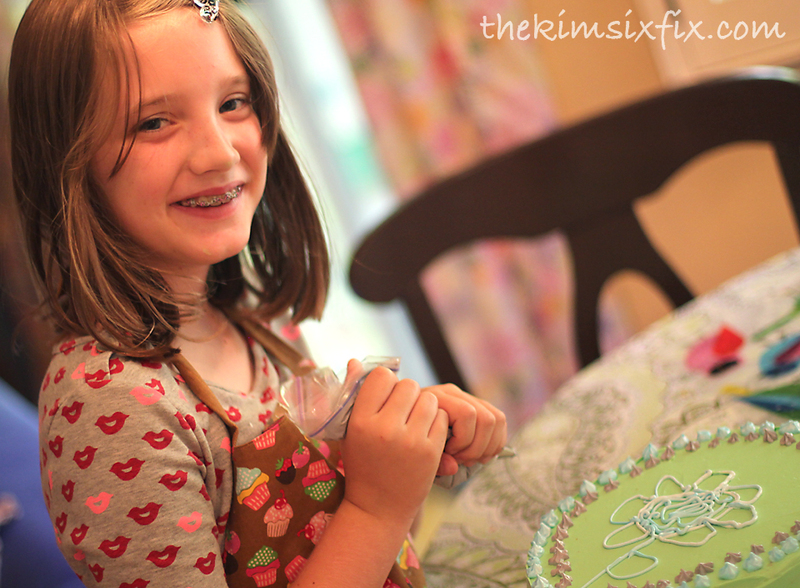 great job and the cupcake apron is too cute! 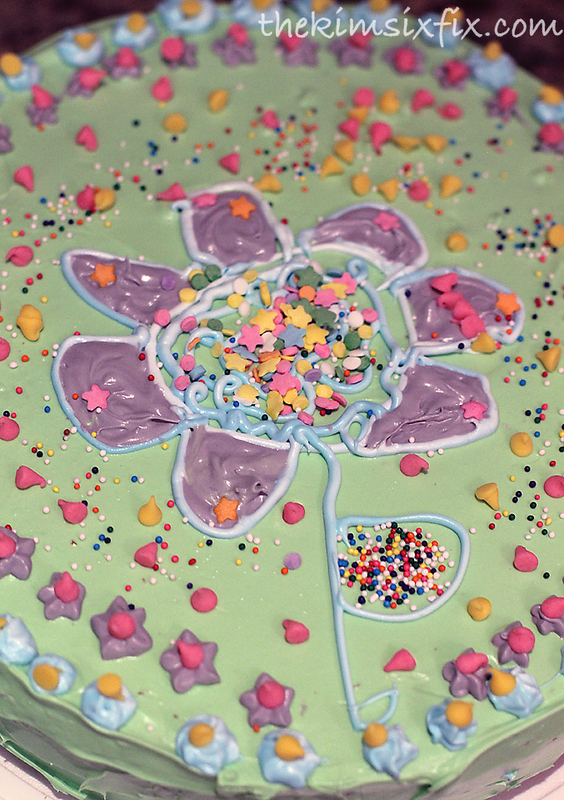 beautiful cake from a beautiful 7 year old! I love this idea! Yes, giving control over to your kids can be so scary - I completely agree! but, I love how your are building her confidence and letting her explore her creativity! She did such a great job!